I bought more cauliflower this past week. It couldn’t be helped. I tried not too, but with my recent good experiences using cauliflower, its siren call was too compelling to resist. Alas, such is life. I’d never made a pizza before; well, if you don’t count those english muffins you make as a kid (good times). 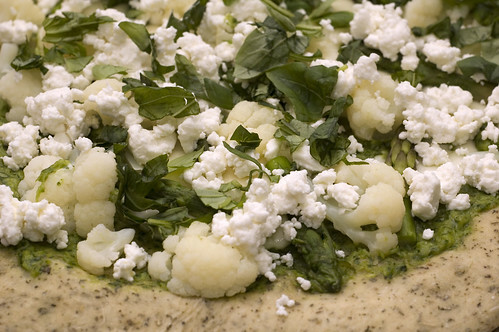 I’ve also never had a pizza with cauliflower, so I really have no idea where the inspiration for this one came from. But come it did and here are the results. Not a bad first try if I do say so myself. In hindsight, I’d recommend a thin crust for this pizza. I tried half with hazelnuts and half with pine nuts, but can’t recommend one over the other. I prefer the hazel nut, but it’s all about taste. Steam the cauliflower for 4 minutes then set aside. Steam the asparagus for 2 minutes then set aside. 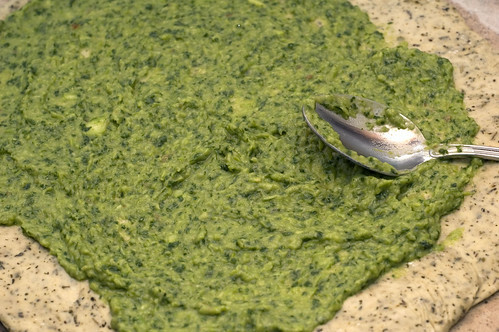 In a food processor, process the garlic, all the asparagus but the heads, 1 handful of basil, salt and one table spoon of oil until in a smooth paste. Depending on the size of you’re food processor you may need to push the sides down a few times. Roll out your dough onto a pizza stone and spread your garlic asparagus paste onto your dough, leaving an inch on the outside bare. Spread your mozzarella slices onto your pizza spread about and bake for 7 minutes. Remove from the oven and spread about your asparagus heads and cauliflower. 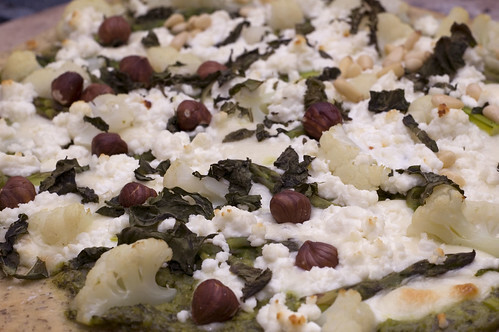 Sprinkle the goat cheese, your choice of nuts and the other handful of basil. Bake for an additional 10 minutes until the choose is melted and the crust is golden. Enjoy. are the hazelnuts hard? seems like a big piece of crunchy. what do hazelnuts taste like. Hazelnuts are definitely crunchy and that won’t change after baking. If that’s something that turns you off, go for the pine nuts. What do hazelnuts taste like? Hmm, that’s a hard one that I don’t really know how to describe. They’re often paired with things like chocolate or coffee. Sorry, not much help there. Interesting fact: Hazelnut seems to make things taste sweeter (coffee for example) but doesn’t have much natural sugar, so we really aren’t sure why. It seems to enhance a flavor while staying in the background. I wouldn’t expect the hazelnuts in this recipe to remind you of Nutella. i’ve had hazelnut chocolate, hazelnut coffee, and nutella, and i don’t believe you that it tastes like that. but i’ll have to buy one from the bulk bin just to try it out. yes, one. from the bulk bin. Hazelnuts often serve as a compliment to something, rarely as the primary flavor; so no, when you try hazelnuts it probably won’t remind you of the chocolate, coffee or Nutella you’ve had in the past. Hazelnuts are pretty mild by themselves. I’ll bring you some tomorrow. Yeah, I tried some plain hazelnuts once while throwing them into a brownie batter and there was no dominant taste. OK, I have a question here. Where does your one clove of roasted garlic come from? Are you telling me you first fire up your entire oven just to roast one piddly little clove? Or is there some way you buy it pre-roasted? Or is it a whole head of garlic you are pre-roasting, then putting in your sauce? Re: hazelnuts: They are very compatible with cauliflower. I once tried an awesome recipe from Nancy Silverton’s sandwich book that was an open-faced sandwich with salty garlicky creamed cauliflower topped with chopped roasted hazelnuts. It was to die for. Incidentally, toasting the hazelnuts really brings out the flavor. You haven’t really tried a hazelnut till you’ve had it toasted. I would describe the flavor as rich and, um, nutty, with a hint of bitterness in there somewhere. I’m a huge fan. Ahh, good eye! My mistake, that should say one head of garlic. And I will definitely try this recipe again after roasting the hazelnuts; perhaps using Heidi’s recipe.